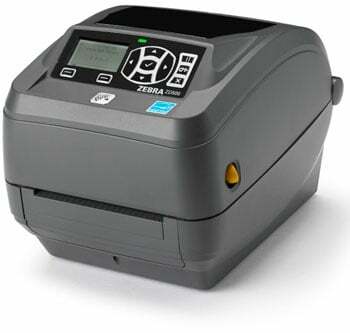 The new Zebra ZD500 is an addition to Zebra’s family of performance desktop label printers, offering advanced features and the ultimate in connectivity options. It is designed for applications where print speed and quality are critical. Featuring the Link-OS environment, an open platform that pairs an operating system for smart Zebra devices with powerful software apps, the ZD500 is easy to integrate, manage and maintain from anywhere around the globe. This is ideal for applications such as retail, where onsite technical support may not be available and operator training is minimal. The ZD500 is ideal for a broad range of applications in the retail, manufacturing, healthcare and hospitality industries. A compact footprint makes the ZD500 ideal for applications where space is limited. Near Field Communications (NFC) technology allows users to pair smart devices with a tap for quick troubleshooting. Securely and directly interact with the Cloud for printing and device management via Cloud Connect. Edit and manage one printer, batches of printers of all Link-OS printers across their network – anywhere in the word – with Profile Manager. Quickly send profiles to many printers at once via Profile Manager Tools.